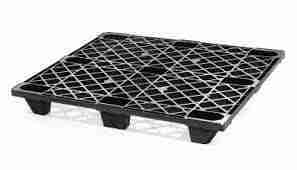 What are the options you require for your plastic pallet application? Purchasers of plastic pallets will have a wide variety of nestable, rackable and stackable pallets to choose from, depending upon the style that best fits their needs, not to mention a vast array of other options. Let’s take a closer look. When pallets are empty, nestable pallet legs nest inside of each other to save space in transport and storage. Nestable pallets or skids are so named because when empty, they nest together when stacked, with the feet or legs sliding into apertures or openings in the top deck of the pallet below, thus minimizing the storage and shipping space required. 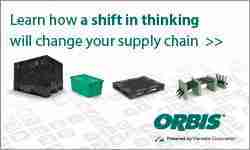 This translates into more efficient use of space in crowded retail back rooms, and greater transportation efficiencies when shipping the empty pallets back to the distribution center or another supplier. Nestable pallets are typically durable, lightweight models that are used in many applications where the emphasis is on transportation and pallet unloading rather than storage – they are typically not designed for racking or stacking. Sometimes referred to as distribution or downstream pallets, they are used widely by grocery retailers for the picking and shipping of orders to retail outlets, as well as by the U.S. Postal Service. Rackable/Stackable pallets are designed with a bottom face or deck that allows unit loads to be safely stacked on top of each other in the case of stackable pallets, or safely edge racked in racking storage systems in the case of rackable pallets. Common bottom deck configurations for rackable/stackable pallets include picture frame, picture frame with crossbar, or three-runner configurations. Rackable pallets must be very strong to perform this function. Plastic pallets are furthermore often classified as heavy duty, medium duty or light duty pallets, with the implication that heavy duty pallets are made with more material and designed to be stronger, for example as in rackable pallets, while light-duty pallets are made with less material, and are designed for only limited use before being recycling. 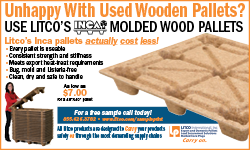 Light duty or medium duty pallets are often used for export because of their lower price point as well as the exempt status for ISPM-15 enjoyed by plastic pallets. Top deck: solid or vented? Washable in an automated system? Bottom deck style and coverage: nestable nine-leg, picture frame, cruciform, three or four runners, etc. If edge-rackable, one direction or two? 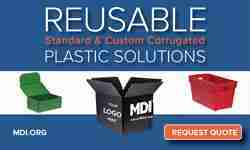 Interested in finding a plastic pallet supplier? Be sure to check out our plastic pallet vendor listing.